Soma (Carisoprodol) belongs to a class of medications that are commonly referred to as muscle relaxers. It is generally prescribed to patients in an effort to relieve pain associated with injury or other muscle conditions. Some of the most serious Soma side effects include paralysis, loss of sensation, confusion and loss of vision. While none of these side effects are immediately life threatening, they should be reported to a physician if they last longer than a few hours or become extremely bothersome. The dosage of the medication may need to be adjusted or a physician may need to prescribe a milder medication. Patients who experience any of these side effects should immediately stop taking Soma and contact their physicians; failure to do so may lead to irreversible bodily harm or even death. Allergic reactions are very rare but they do occur; the symptoms include facial swelling, hives and difficulty breathing. Patients who experience a severe allergic reaction should stop using the medication and seek immediate medical treatment. 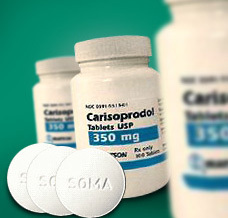 Carisoprodol has been assigned to the pregnancy category C by the FDA, meaning that the drug has been shown to cross the placenta into the fetus and cause harm to the unborn baby. As with any medication, pregnant women should only use Soma if the benefit of using the drug greatly outweighs any risks associated with it. Soma also passes into breast milk; nursing mothers should avoid using Carisoprodol while nursing or supplement with infant formula if the drug must be used. The most common Soma side effects reported in nursing infants were sedation, lethargy and failure to feed properly. There have not been adequate studies on the effects of Carisoprodol in children to facilitate its widespread prescription to children under the age of 16. Even so, some physicians will prescribe the medication to children as young as 12 when the benefits that the drug provides outweighs any of the risks. When Soma is prescribed to children under the age of 16, the dosage is altered based upon the child’s weight and any other sedating medications the patient is taking. Juvenile patients should be monitored very closely for the more severe side effects; even the mild side effects should be reported to a physician if they last for more than a few hours or become particularly bothersome. Who Should Not Use Soma? Although Soma is generally not prescribed to patients that fit any of these groups, exceptions can sometimes be made based upon the need for the medication as opposed to its risks. Elderly patients should avoid taking Carisoprodol due to the increased incidence of severe side effects, especially those that affect vision and mental status. When the use of muscle relaxants such as Soma cannot be avoided in an elderly patient, physicians will prescribe the lowest dose that treats the pain for the shortest amount of time possible. Caregivers should closely monitor elderly patients who have been prescribed Soma for irritability, increased confusion, lethargy and seizures. If any of these are observed, the elderly patient should immediately stop taking the medication and consult with a physician. Patients who are suffering from muscle injuries or chronic muscular or skeletal conditions can certainly benefit from medications like Soma, but these patients should always watch closely for the development of serious Soma side effects and drug interactions.